Originally from Yorkshire, Katy spent her childhood feeding her love for art with a self taught approach to drawing and painting. 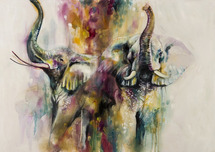 Pursuing art throughout her educated life through to the University of Lincoln, where she currently resides, Katy applied her second love for wildlife and nature in her artistic ventures. Inspired by the ethereal qualities of Odilon Redon, and further by his use of vivid colour, Katy descended into opulent oil paintings of wildlife scenes, nature, and animals, with spontaneous and kinetic overtones. 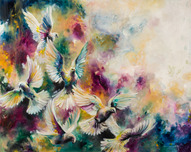 Further admiration for elegance and richness of palette brought Katy to to create oil paintings with a plethora of colour, and a blend of drama, harmony, presence, and dissolve.